Excel 2010 is a spreadsheet application in the Microsoft 2010 Office Suite. Excel allows you to store, manipulate, and analyze data in organized workbooks for personal and business tasks. 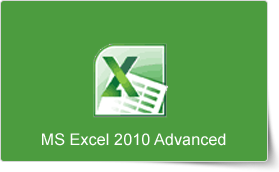 This Microsoft Excel 2010 Advanced training course is the third and final course in the Excel 2010 series. This course helps participants get a deeper understanding of the advanced functions and features available, and elevates the participants’ Excel skills to an expert level. This course from PD Training is designed for participants to learn how to automate common tasks; apply advanced analysis techniques to more complex data sets;use logical, math and statistic functions; and leverage on Excel’s advanced functionality to boost productivity and streamline everyday work. This Microsoft Excel 2010 Advanced training course can be delivered at your premises by one of our expert local or international trainers or live online using our HIVE technology. This Excel 2010 Advanced training course running in Central and Hong Kong wide, is rated 5.0/5.0 in overall quality by ProCert Labs, builds on the skills and concepts taught in Excel 2010: Intermediate. Participants will work with advanced formulas, as well as lookup functions such as VLOOKUP, MATCH, and INDEX. In addition, participants will learn about data validation and database functions such as DSUM. They will learn how to import and export data, and how to query external databases.